Boasting a user-friendly interface and a practical set of screen recorder features, Debut Video Capture Software easily places itself as one of the best screen capture software in the market today. I’ve been using this software for days now and I find truly convenient. Not only does it record my screen but also content from a wide array of online and external sources, even from such outmoded devices as the good ol’ VHS. All the great features are nicely laid out on the main window so they are very easy to find. If you can’t figure out how to record your screen, Debut Video / Screen Capture Software is a great way to start; it is very easy to set up and customize to screen capture video content. 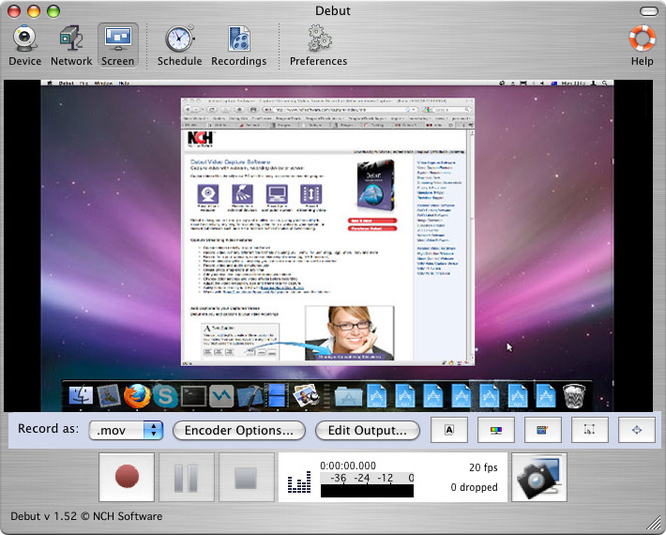 Debut Video Capture has all the basic features you are looking for in a screen recorder. At the bottom right corner of screen capture mode, you’ll find buttons that will allow you to capture the entire screen or just a part of it. You can also adjust the effects such contrast, gamma and brightness, and even add video caption effects, video color effects, and watermarks to your recording. Getting your way around the application is very easy because the toolbar houses all the important features you will need: device, network, screen, schedule, recordings, options and help. Debut produces great quality output and does everything it promises. If you’re looking to capture conference audios or provide narration to videos, you can do so by selecting the microphone of your choice as input. You can also turn on your speakers to record whatever audio that comes out of the media you’re recording. In case of tutorials and Power Point presentations, you can improve the the viewing experience of your bottom line by highlighting the mouse cursor as you move it around and zooming into important parts of your presentation using the mouse scroll. You can change the color of the cursor to make it pop. 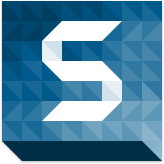 This recording software is a great tool that to help you create tutorials and walkthrough videos. Debut allows you to save media content such as Power Point presentations or your favorite entertainment programs from YouTube, Hulu, Netflix and in the string of similar on-demand internet streaming media services, to your computer. To record, click the Screen button on the main page to put Debut on video screen capture mode. The start, pause and stop recording buttons are conveniently located at the bottom part of the software so they are impossible to miss. Once you hit the start button, the recording software will prompt you that it will minimize and you have to press hotkey CTRL+10 or click Debut icon on the system tray to stop the recording. Debut Video Capture is indubitably among the niftiest video recorders online. Moreover, Debut Video / Screen Capture Software can record content from other video input devices such the VCD player, DVD player and VHS recorder. It also captures and records footage from built-in webcams and network IP cameras, a feature that will come in handy in the event that you lose your webcam software. If you have multiple webcams in your network, go to Options and select the webcam you want to use. To ensure that you’re using the right webcam, click the Device button on the main page to display the view of the webcam in use. For devices other than webcams, you need a USB video capture device to connect your external device to your computer’s USB port. Like most video recording software in the market, Debut Video Capture for Windows / Mac offers real-time recording and scheduled recording. You can easily find this feature on the main page. Make sure to check Active on the Schedule box though or the schedule you set will be disabled. Videos you capture will be saved by default to your hard drive in the format of your choosing Available formatsinclude MP4, AVI, MOV, MPG, FLV, SWF, DV and 3GP. Screenshots will be saved as as JPG and PNG files. If you want to resize the final video or adjust it’s frame rate, click Edit Output. This feature is helpful if you want to keep the file size of your recording small. To view all your recordings, click the Recording button on the main page. You can start and stop your recording through hot keys. Debut Video Capture software for Windows / Mac also has it’s fair share of setbacks. Help and support is only accessible if you purchase the recording software or one of their technical support plans. Otherwise, your queries will be low on their priority list. The basic support plan is very affordable but Silver, Gold and Platinum plans are quite costly. You can consult them via email and telephone which both have time limits and if you don’t use your support plans in the allotted time which is between a month to three months, your plan expires. If you don’t want to pay extra for support, the application actually provides help and support resources that should have all the basic information that you may need. To get to the resources page, click the Help button on the main page. There’s a lot of resource materials about important topics such as color settings, hotkeys, saved selections, scheduled recordings, text caption settings and many more that you’ll find on the resource page. All these resources can be downloaded from within the software. 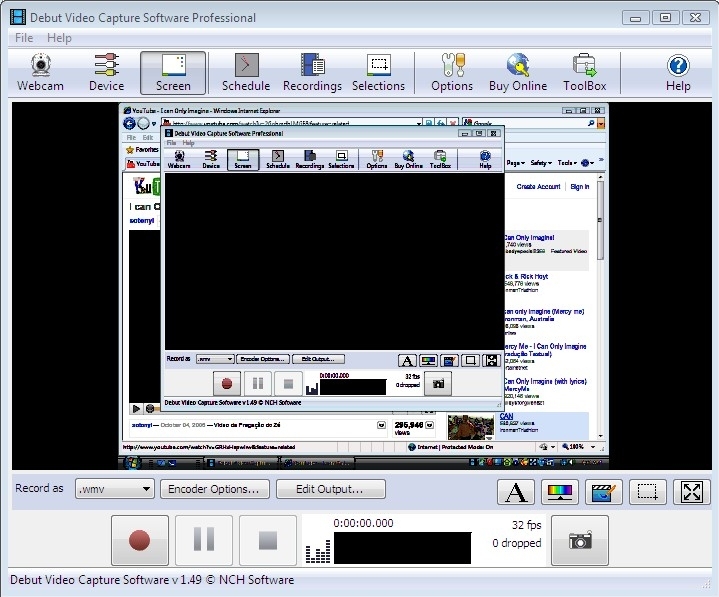 Debut Video Capture Software doesn’t have the most robust set of video editing tools as other screen recording software . It also lacks advanced features such as splitting and joining audio and video files (splicing) or the capability to convert audio files to MP3, WMA or WAV. Debut’s simple interface is what makes it one of the best screen recorders out there. It has all the basic but essential video/screen recording features such as crop, time stamps, watermarks, text tool that captions a frame or the entire video, and many more. It works pretty great until the trial runs out, then you have to purchase the software.